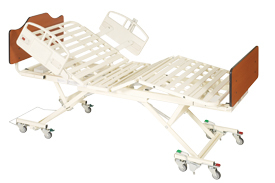 NOA Medical's newest high/low bed system quickly rises from a low of 8.5" to a high of 25"
Fully Adjustable. The four motors provides your residents with comfort positioning at the head and foot area, as well as height adjustment. Standard and High Impact Head and Foot Boards are available in a variety of colors. Able to effectively meet the needs of your clinical staff as well, the NOA Light provides a safe working load of 450 lbs. and offers a number of quality standard accessories as well. Bed system package includes the deck and frame, the electronics, mattress stays at corners, and handset all for one low price. Rises from a low of 8.5" to a high of 25". Has 4 DC Motors that provide elevation, head and foot adjustment. Has a sturdy slat deck providing a solid sleep surface and mattress ventilation. Is 35" wide by 80" long. Can be moved in any position. bed width, with side rails 40.0"
bed width, with assist bars 36.5"
deck height range 8.5" to 25"